The Johnny Manziel era started for the Cleveland Browns on Saturday night in Detroit during a 13-12 loss to the Lions. Manziel followed starter Brian Hoyer but did not generate significant offense against Detroit’s defensive reserves. The rookie quarterback completed 7 of 11 passes for 63 yards and led Cleveland in rushing yards with 27 off six carries; while leading the Browns to a field goal in the process. Manziel’s pro debut wasn’t exactly an awe-inspiring performance but good enough to build on. At times he looked unsettled in the pocket, opting to take off right away at the first sign of trouble – a common thread among mobile rookie quarterbacks. Here’s what I’m definitely tired of already: can we call a moratorium on the nickname “Johnny Football”? After one game, I’m already worn out. The Browns return to action next Monday night against the Washington Redskins. 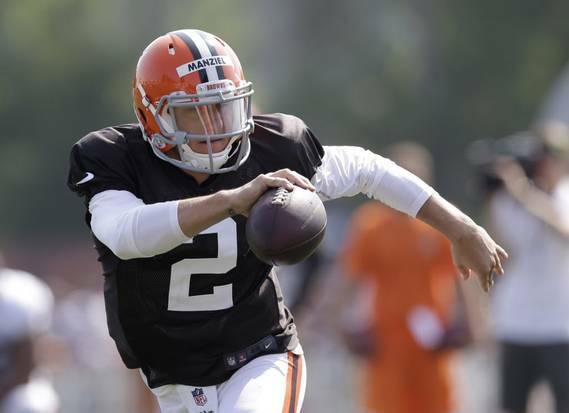 UPDATE – 11:54AM – A CBS Sports report states that Manziel is set to replace Hoyer as starting quarterback in Cleveland. So much for the “Hoyer is just like Brady” articles.